The Reds are 4-5 through the first nine games of this 10-game homestand, and they need a win this afternoon to even up both the homestand and the series against the Dodgers. Johnny Cueto is second @Reds pitcher since 1914 (Gary Nolan, 1967) to have a pair of games in a season with at least 12 Ks and 0 walks. Taking the ball for Cincinnati is right-hander Alfredo Simon. Simon, of course, was pulled into the rotation in Spring Training to replace the injured Mat Latos. With Latos returning this weekend, all signs point to Simon remaining in the rotation with Tony Cingrani going to either the bullpen or AAA. Dodgers starter Zack Greinke has also hit a bit of a lull recently. Before his last start against Cincinnati on May 27, Greinke had a 2.01 ERA. In his last three starts, including that Reds game, Greinke has allowed 10 earned runs over 20.2 innings. Today’s lineup includes Skip Schumaker leading off and playing leftfield, while Roger Bernadina takes over in centerfield and bats 7th. Each player also made a start in the May 27th game against Greinke, and they each had a single. For the Dodgers, Hanley Ramirez was a late scratch in yesterday’s game due to irritation around the AC joint in his right shoulder. Miguel Rojas takes his place again today and bats 8th. I’d love to see the Reds kick off a long winning streak here as they head off onto a long road trip. Discuss the game and their second consecutive victory against the Dodgers here. Go Reds! I was excited to see Billy Hamilton’s walk and line-drive single last night (stood and cheered, promise). But it really says something when a team has to sit its *leadoff hitter* because the other team’s pitcher is too much of a mismatch. It’s *leadoff* hitter. Did Price actually say that? I agree Steve on Billy’s day yesterday. Big Lutz needs to keep playing in AAA unitl hopefully he gets back in the groove and gets his timing back after Price refused to play him while he was with the big club. Yeah, it says is Baker all over again. It won’t matter though, they’ll probably get 3 hits anyway and a walk from the OBP King. Nicely done Steve. 4 AB’s vs Greinke in LA a couple of weeks ago, Hamilton lined out twice, grounded out twice. Geez. Schumacher is playing because he hits Greinke well. Has nothing to do with Hamilton. Bernadina is playing for Hamilton today because he has a record of hitting a curveball. Price, before the game, said it was a match-up situation. That’s a polite way of saying what I said. I don’t get it. When Billy faces a pitcher like Wainwright, and goes 0-4, we’re told that we shouldn’t count that because of how good the pitcher is. Well, Greinke is just as good as Wainwright. Nothing wrong with what Price is doing. I just wonder how many times other teams don’t play their lead-off hitter because of “match-ups”. I don’t know, seems to me Price just wants to rest him a dat, and if you are going to rest a guy why not pick a day when he would be going against a guy who gives him some matchup problems. I don’t think Price was implying that Hamilton wasn’t playing because he would be a total mis-match against Grienke. There is not a Red that could not use an occasional day off and there is not a Red who does not have some kind of a matchup problem against some pitcher, even Votto. “He didn’t play every day when he was up in September. He did go to Puerto Rico [for winter ball],” Reds manager Bryan Price said. “That kind of wore him down, I think. But he does play center field. He’s 160 pounds. He plays hard. He runs hard. He does everything at 100 percent, which great. Uh yeah, that is a bit different than what the original post inferred. Thanks for doing the research and clearing this up. I was listening to the pre-game interview on the radio. The first reason he gave for sitting Hamilton was the match-up. Said the Bernadina had a better record against pitchers like Greinke with a curve ball. Not only Greinke but he also mentioned Arroyo. It says we have a smart manager who knows he has a very young raw “leadoff hitter” who he would like to put in the best positions for him to be successful and figured today against a very good pitcher would be a good day to get a bench player who has had some success get a start. Sound baseball from a baseball guy not bouned by just stats. Today’s game (12:35 p.m.) is being televised nationally on the MLB network. No, he means MLB Network. I know it is carried by the satellite carriers (DISH and DirectTV). According to this link, it is also on Cincinnati Time Warner channel 326. A sixteen game road trip coming up after today punctuated by three games with Toronto at home. That sounds like a winning combination for the rest of June! Uh Oh… rocky start here. Simon may be having a rough day. Super Todd with a GABP special! Yes… getting after Grienke! Votto double. Atta boy Joey. 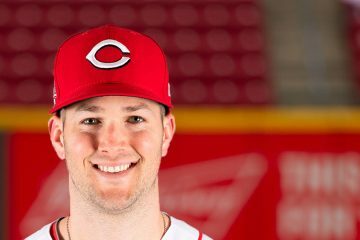 Who are these guys and what have they done with the Reds players? This day Simon will need far more runs by our guys. I never understood how some guys get days off and others don’t. Hammy should be in every freaking day just like they run Bruce out there. Even Bruce usually gets thrown a day off against a tough lefty. Rarely…….Very Rarely……Remember those long 0-fer months where he just kept on keeping on it the lineup? I guess I don’t understand what Hamilton has done that would favor him playing every single day? Since he is young and has potential (and the Reds called him up for some reason), he should play the majority of the time. But that doesn’t mean he has to play 100% of the time. In fact, based on his struggles, I think the Reds should have already started giving some of his games to Heisey & Schumaker. Hamilton’s style of play is pretty hard on the body, and his stinking up the joint offensively has to be hard on the psyche. Steiner.. “Great American Small Park”. Awesome! 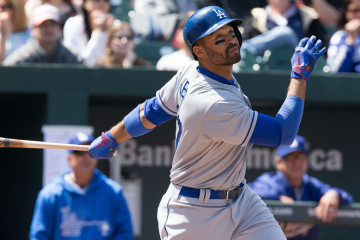 I’m THRILLED Brandon’s bat on ball was constructive – even if the Dodgers had made the play. I’m probably in the minority on this, but I wish Brantley didn’t feel the need to talk constantly during Marty’s innings of play-by-play. Typically he’s just stating the obvious. I cannot stand replay. That just broke the Reds momentum and gave Greinke a chance to settle down when we had him on the ropes. Just curious – which strikeout bugs you more as a baseball fan? A) Swinging and missing ball four OR B) Taking strike three. I hate them both but think I hate taking strike three a little more. For me its about how often that player repeats the offense. Which offense? The take or the miss? Both! Hate it when Cozy or Bruce swing at ball 4. Although Bruce seems to be improved in that dept this year. A) The Dodgers announcers whine as much as the team. B) I think Phillips was probably out, but I didn’t see conclusive proof. We’ve lost more obvious challenges before. I can’t figure out why Simon doesn’t strike out more batters. Mid-90s fastball, good control of multiple pitches….he should strike out a lot more. I’ve always wondered this, too. His career K/9 is 6.4. I watch a lot of baseball and feel I have a decent understanding of the game, but I don’t even have the beginnings of a theory as to why his K/9 rate is so low. Anyone of you stat geeks have the numbers on Reds pitchers who have an 0 – 2 count on the batter and then throw ball one? I know you hate to give up an 0 – 2 hit on a juicy pitch (point being it’s juicy) but it seems like if you’re batting against our pitchers, when down two strikes, you definitely rest your bat on the next pitch and be gifted that first ball. I’m gonna guess it’s 99.7% of the time. Our guys seem to the the “obvious” ball. I wish they would try to throw the perfect pitch…outside corner at the knees. One positive that I’ve seen in the past week or so is that Cozart seems to be hitting the other way more often. I would sacrifice his power for about 25 points in BA and less strikeouts. +1….I noticed that too…he’s a much better hitter when he doesn’t try to pull. Simon is doing his job, let’s get a couple more runs – top of the lineup. Be nice to get some more runs- can they get 4 more innings out of Simon? Is everyone availble in the pen? Can’t imagine that Broxton is. Threw nearly 40 pitches yesterday. Yep. No Big Brox today. Hoover or LeCure then Chapman. Not sure we are ready to trust Hoover with a lead, hopefully Simon can go 7 or even 8. He needs to be on a batter by batter leash with a 1 run lead. Need to score 2 more. Interesting to listen to Dodger announcers talk about the Dodger offence not being able to hit in scoring situations. Ok Redlegs… go get some runs. I have meetings for the next 3 hours, so I expect to see a “W” when I check back in. Simon pitching smart. He is letting the batters get themselves out. 11 in a row. I show up just in time to see a strike em out throw em out. Nice job Simon and Mes. Frazier is turning into some kind of ballplayer! 3rd in the NL in homers. Gold glove defense at 3B. Yeah, he’s ok.
Trouble a brewin’. Limit this to 1 run and I’ll be happy. Do you think the next Game Thread intro will say something to the effect of, “Simon is ready to blow up any time now and let’s pray it’s not today”? I get a kick out of it and hope he goes through the end of the year proving the naysayers wrong. We only get updates on that when he (or Billy) has off games. Pretty much, I mean they are Reds right?? Makes you wonder sometimes. Way to stiffen up Simon!!! Grienke out of the game now for a pinch hitter. Let’s get that 3rd out now. Bruce leading off against a LHP. need at least 1 more run. Com’on guys. now is the time! I’m guessing Broxton is not going to be available today? 29 pitches yesterday so maybe a batter or two? Unlikely and Sam should be fresh. I’d almost say roll Cingrani out there for the 8th and see what he does. But…. not really fair to the guy to just throw him in the fire. Lecure 8th and Chapman for the 9th is probably the safest call. I’m OK with Simon starting the 8th, but Price better have LeCure and Chapman warming up and ready to go if Simon gets in trouble. Was it really necessary to have Simon face Gonzalez, I am glad it worked out- make the double switch- why fan the fire? I think this shows that Chapman is still thought of as a 1 inning guy- if Gonzalez got on then I assume you had a Lecure to come on but Price seems to have a good feel for his starters (thought he should have left Cueto in for 1 more last night) and having Chapman and Broxton makes managing this bullpen a lot easier. dang…. I guess Price knows his pitchers! Great job Alfredo against the best they had to offer. BTW, did Price have anyone warmed up and ready in the bullpen, just in case? At what point do we start talking about Simon for the AS game? 3 more outs and I would think those are Chapman’s. Very impressive outing by Alfredo. Don’t look now but Zack is heating up. This must be Simon’s best start of the season. Good job Simon! Awesome job of Cozart he is starting to look decent out there. Congrats to Bham with a sacrifice just what was needed. Did the Dodgers sneak Marmol out to the mound? No , the Bats are still looking for him. Brandon League is looking like toast. LoL wow. I wonder what Phillip’s face is saying. The biggest insult you could give the guy PH for him with Ryan Ludwick. Somebody has to help out the Old Cossack here! Bryan is pinch hitting for his cleaup hitter with 2 outs and 2 on? What The Heck!? scratching my head too. but it got us another run plated. Makes Price look like a genius. The results don’t justify the decision. Quite frankly, the fact that Bryan made such a decision speaks to the issue of batting Phillips in the top half of the lineup at all. this the type of game Reds need to play all the time; no stars, great pitching , good at bats, and solid basic baseball. Of course he’s hurt. It’s a rule that we cannot field a healthy team for more than 3 days at a time. That was a heckuva pitching performance by Simon. Those 2 add on runs were huge. I hope there is nothing seriously wrong with Phillips. I cannot believe that Rojas made contact there. That was pitch number 15 for Aroldis Chapman; his effectiveness may start slipping, as he holds opposing hitters to a .081 average in the first 15 pitches but they hit .111 off him after that. Yeah …. love gameday, but it may be time to retire the scouting report feature unless it’s meant for occasional comic relief. These secondary pitches are insane. When did he learn to do this? Sweet! Another massive win for the Reds!!! 92 mph slider from Chapman ought to be against the rules. Last 2 games, the Reds have looked like the real deal. Great pitching, timely hitting, flawless execution and superior fielding. What’s not to like! Could it be having MVP back has given the club some much needed confidence? Bummer that Chapman didn’t earn a save yesterday or today with that masterful pitching. When you PH for your cleanup hitter, and also the team intentionally walks your #3 hitter who’s fresh off the DL in order to get to your #4 hitter, maybe that guy shouldn’t be your #4 hitter anymore? Kind of like how BP sac bunted earlier in the year as the #3 hitter. How do you see that? There is no question from a straight hitters perspective Joey is a better hitter the Phillips. But then again he is the best pure hitter on the roster, so if Bruce was hitting 4th today and they walk Votto would you say the same thing? Or what about Frazier? I am willing to bet whomever the Reds had hitting 4th today, in that situation, Votto gets walked no matter what. Drew you may have something. they weren’t doing that earlier in the season, they were going after Votto. Are the Dodgers showing they know something or have seen something in Votto’s swing since returning from the DL? I agree with this Drew. But I just wish we had ONE more batter close to the realm of “I wanna avoid pitching to him” besides Votto. One more like that and we are a real contender again. I think we have them on the roster in the form of Devin and Todd, both are “trending” that way and I think if we are just paitent they will be those types of hitters. Also we have Bruce, who when “in the zone” is somone teams do NOT want to pitch to. that is it, Fun Baseball!!! It seems this talented team is finally coming together. Hopefully when the upcoming 16 games on the road ends on July 2nd., the Reds will be on the positive side of five hundred %.